This was the first (and only for this trip) morning I didn't have to work, so I wanted to walk to a nice breakfast outside the hotel. As I was getting ready, the sudden downpour was disheartening, but it didn't - it couldn't - dissuade me. Yesterday I asked my friend if it's safe to get wet in the rain - or is there a dangerous acid rain problem. He told me an ancient Chinese proverb: if a woman gets wet in the rain, she will be fertile. I asked - what about men? He replied that, after it has been raining for an hour, the acid should be gone and you'll be safe. Just to be on the safe side, I donned my jacket and baseball cap. I asked the hotel bellman for directions to a brunch place I had visited on my last trip in February. He twice tried to flag me a cab, both times I stopped to explain that I want directions to go on foot. He checked out what I was wearing, and then smiled understandingly "ahhh North Face, he will protect you." I love the Chinese instinct to personify everything. His directions were perfect, but in retrospect perhaps I was 'overprotected' - just the umbrella would've been fine. After brunch, I asked the same bellman for advice on what to do. From his list: sightseeing bus, art museum, wax museum, Expo, shopping at the knock-off center, the last one piqued my interest. I had been there briefly and wanted to explore further. Changed into lighter clothes, course plotted, away I went. I did end up buying two pairs of jeans: one high quality knockoff and one lower quality knockoff. Although a great "value" if you consider what I paid for allegedly Armani and Diesel brand jeans, if you consider that they won't last very long - and that I could've bought 1 pair of Gap jeans that would last several years for what I paid for these two, I'm not sure it will pay off. In the meantime, we'll see if anybody is impressed with my soon to be short-lived Armani-ish. The only easy/painless negotiation was - while I was waiting for my jeans to be hemmed - I popped into a luggage stall to see what the options were. After recent issues getting Samsonite / American Tourister to honor their 10-year warranties, I figured how bad could a fake Samsonite be? Well, the difference is that the zippers on the fake luggage break in the store rather than after several years of use. When I stated I wanted a higher quality product, he said "oh you want Tumi" or "You'll like Samsonite." When everything is an inferior copy, the whole concept of brand=quality is silly. It might have a similar aesthetic design to a known brand, and have copious labels/tags, but that's where the similarity ends. Although I was curious, I didn't even bother to ask the price, knowing that once you win the negotiation, you're expected to buy it. 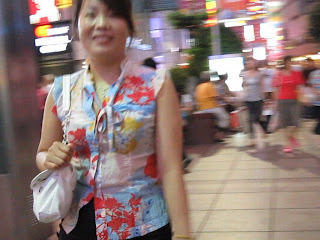 On my way out, unprovoked, he quoted 180 RMB (about $25) for either of two suitcases I liked. That's about 1/4 the US price, I guess. Will it last 1/4 as long? What's the risk when it breaks mid-trip? Still, the lack of negotiation was refreshing. As I was leaving the knock-off mall and crossing the street, the man in front of me almost had his "leather" shoulder bag driven over when the shoulder strap broke off. He and his group just kept walking, completely unphased that one of their several new bags needed to be repaired or trashed. Continued my walk to the Bund and this time I did make it all the way from my hotel to the Bund. Stopped for a beer at The Bund Brewery, then turned around to return. Passed by a group of 3 very friendly 20-something Chinese folks - 2 guys and a lady - who were very inquisitive about what I'm doing in China, how Americans feel about China, what sights I have seen, etc. Initially this caught me off guard as the only Chinese folks who stop me while walking are pairs of 2 young ladies who want to know "where are you going?" "where are you from?" "are you here alone?" These three seemed nice enough - although the ladies were friendly too - so I put myself on alert level yellow. They were on their way to buy tickets to an acrobatic show (two of them are visiting from Xi'an) and wondered if I wanted to join them. I didn't want to see the show, but I was curious about the process. We went into a small room in an unmarked building in a dark alley. We were seated at a table that seats 4 - it had cups kettles and jars of tea leaves on it. After they bought their tickets and I explained I would prefer to see it with my wife and coworkers, they asked if I would like to participate in a tea ceremony. They were going to do it, and besides, I had been wondering what I would do tonight. The tea menu came out and I selected a tea that was listed at 68 RMB (about $10) - seemed reasonable for an interesting experience - and medium-priced compared to my new friends. I was keeping an eye on safety - to make sure nothing is slipped into my tea etc. The tea ceremony itself was neat - there were many traditions explained and fancy flourishes. When the ceremony was over, the server explained that they are only serving tea - this is still a ticket agency mind you - while the expo is in session, and as it's ending soon, they are starting to sell some to take home. I didn't particularly want to take any home, but my friends encouraged me to do so "oh the box is free when you buy the tea!" they excitedly discovered. This was when my guard went up to alert level orange, but I didn't want to rock the boat too much. There was a fair amount of peer pressure from these three friendly folks to buy the tea, so I selected the smallest box of one style we had during the ceremony: "4 beauties" which is comprised of four flowers and it blossoms when hot water is added. Then the bill arrived: between 590-640 RMB per person, mine being the slightly lower side. This included the teas we sampled, the ceremony, a sitting fee, tea snacks (tea-crusted peanuts and pumpkin seeds), and the to-go tea. And no, they don't take credit cards. Again my new "friend" was more than eager to loan me the money until we hit an ATM. Once I had repaid him, I parted their company as quickly and safely as possible. This is one friendship I could not afford. PHOTO CAPTION: There are so many scam artists on this pedestrian section of East Nanjing Road in Shanghai, I let subtly video roll for just seconds before I captured this one starting to work on me. So I paid $85 for a small box of tea and a funny story. It's the most I have paid for anything in Shanghai - ever - unless you include business lunch for 3 at the Peninsula Hotel. I walked back to my hotel to complete the loop, a little bit lighter in the pocket and a little bit wiser. I guess it could've been worse. There are stories online of people getting bilked $150 - $500 for these tea ceremony scams. Now you tell us about Samsonite -- I just bought one of their suitcases because I thought I could trust them to not come apart (for 10 years) while traveling. Hmmmmmm. I like your alert system! You are wise to have one that works for you. The street scam episode could have been worse. I am glad you kept an eye on your surroundings. I guess you know the term for being kidnapped into servitude.